The Alumni Association is excited to host our First Annual Alumni + Family Reunion. 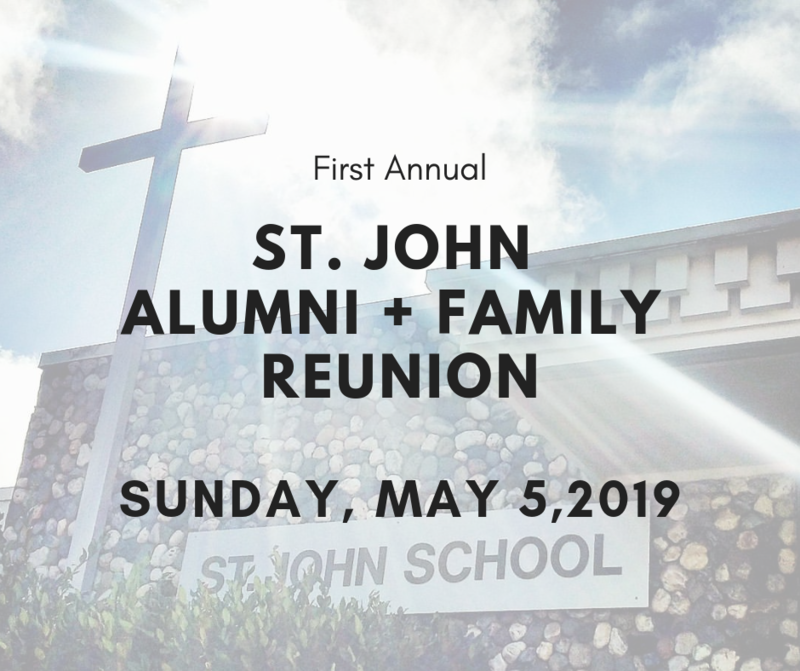 This will be an all class reunion, and families of St. John alumni are invited to celebrate with us. The classes of ’59, ’69, ’79, ’89, ’99 and ’09 will be honored. We hope you will join us for a buffet featuring Mexican breakfast, and brunch favorites prepared by our very own, Mrs. Anna Grande. Tickets may be purchased online or by calling or visiting the school office. St. John School strives for academic excellence with an emphasis on independent thinking and life-long learning. Our goal is to produce well-rounded students that are well prepared to succeed in the high school of their choice. We also focus on the use of technology—not as a single course, but completely immersed into the curriculum. We are a community of faith that nourishes each child’s spiritual, academic, physical, social and emotional growth. The school instills the Ursuline tradition of charity and spirit into every student. Non-Catholic students are welcome and their beliefs are respected. All students are encouraged to share their thoughts throughout the curriculum and are welcomed to participate in religious ceremonies as their comfort level allows. Our school serves transitional kindergarten, kindergarten, elementary and junior high students in the Glen Park neighborhood of San Francisco. Copyright © 2019 Saint John. All Rights Reserved.